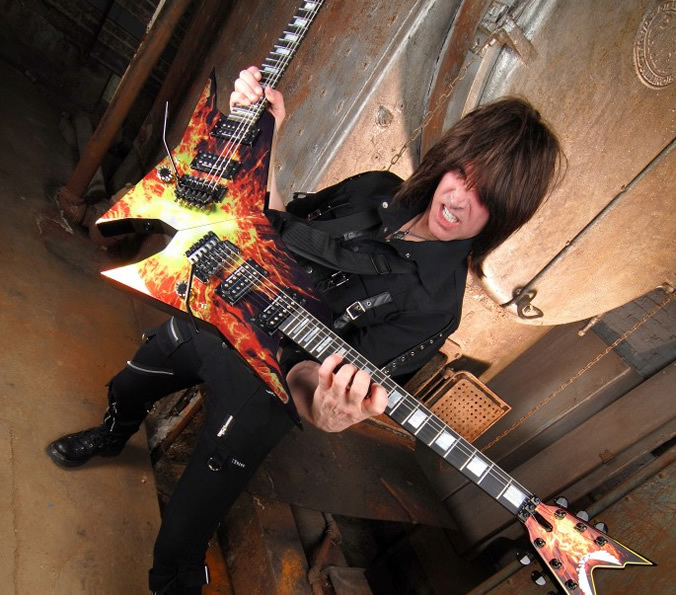 Michael Angelo Batio (MAB) is one of the fastest guitar players in the world. He has been at the forefront of guitar playing and technique since the 80s, when he played with his bands Holland and Nitro. His guitar instructional videos, most notably his DVD series “Speed Kills” have become invaluable tools for guitarists looking to up their game and are filled with techniques now considered “standard” in the world of guitar playing. On top of his long musical career and instructional videos, MAB is one of the originators of the “shred” guitar genre and invented the Double Guitar, one of which can be found in the Rock and Roll Hall of Fame Museum in Cleveland. Batio released his first solo album No Boundaries in 1995. Rat Pak Records is releasing Shred Force 1 (The Essential MAB) 20 years later, an anthology album which includes some of MAB’s most famous recordings, along with some new material created specifically for the new album. The new album can be ordered from Rat Pak Records. Target Audience Magazine sat down with Batio to talk about the new album, guitars, the importance of good technique, and technological innovations in the world of recording. How did the new anthology album come together for you? Was the selection process difficult? It could have been, but Joe O’Brien (the president of Rat Pak Records) and the staff over there had become very familiar with my discography. A few of the songs picked were ones that I play the most in concert or were the most well known. Then for the rest of the album, I deferred to Rat Pak records. They were the ones who picked the songs and put it together in the song order. I think they did a great job. We only had about 80 minutes to fill a CD with, so for me, it took the agony out of picking the songs and deciding which ones to leave out. For the new songs on the album you brought in some outside talent that you hadn’t worked with before. Specifically, Michael Wilton and Todd La Torre from Queensryche and Kurdt Vanderhoof from Metal Church. Can you talk a bit about how their contributions came about? You know, I had over 20 guest stars on the album, and all of these players are busy with recording records or touring, so everyone was on their own schedule. The criteria was… I had to be fans of what the musicians did and I had to like them… we had to be buddies. To get those musicians, especially from Queensryche and Metal Church and even Alice Cooper… that was again, Rat Pak Records. I had never worked with them before, and Joe O’Brien is great about bringing these different people together and creating musical magic. It was his idea to bring these people in. I already had George Lynch and Mark Tremonti and a lot of the other names doing solos on the album, but when we brought Todd and Michael in, it added a whole new dimension on to the album. I knew Michael… I’ve known him for a long time. Todd and I had met, but we didn’t know each other that well. He did a fantastic job on both of his songs, and I couldn’t be happier with the way he sang. I’m not just saying this because he’s on my record… he’s one of my favorite singers. I really love his voice. He’s a drummer actually. He didn’t start off being a lead singer. He just has this incredible voice and is a great front man. Regarding the actual technology behind recording music, how do you think has modern technology helped or hindered your creative process, compared to 30 years ago? I think it has helped tremendously. The biggest difference is, when I played in my former bands and we recorded to tape, we had to rehearse and have everything worked out in our heads and fingers before we went into the studio. It was a lot of money, you were there with a lot of people and you couldn’t punch into the middle of a song. There was no editing. If there wasn’t a huge space, you couldn’t edit. So, when you hear early albums that I played on, and even my first solo album, No Boundaries, it was old-school recording. I had to play those solos live in one take. Obviously, I didn’t use the first take that I played; I could do a hundred takes and use the first one, but I couldn’t edit pieces together like you can do today. Even my instructional DVDs, “Speed Kills,” that’s one recording, live. That’s it. There’s no edits, there’s no anything… it wasn’t available to us at that time. It was a different thought process. You had to be really prepared, and sometimes you just jammed, because there were some things you wanted to leave open and spontaneous, but for the most part you had to have it ready. Today, I think the beautiful, great thing about the technology is that you can rehearse while you record. That’s a unique difference. I can play a part and ask “Do I like it? Yeah! Do I not like it? No.. get rid of it,” and then just get rid of that part. Every solo I hear from my band Holland or Nitro was one take. There was no edits. That was it. You “Shut Up ‘n Play Yer Guitar” as Frank Zappa said. There are little mistakes here and there. That’s the way it was. It’s going to remain that way forever. It’s completely different than now. I think that with the way you can record now, there are people who can’t play well that can cheat, or with people that can’t sing well, they can auto-tune it, but I don’t think it makes for better players and I don’t even think it makes for better music. It makes bad musicians sound good, but I don’t think it makes them sound great. It makes good musicians sound very good, but I think greatness is still something that no matter how many edits you do, if you’re not great to start with, it’s going to be tough to make it that way. What do you think about the technological changes in the guitars themselves? How has that changed for you personally in your career? How do you approach it? I’m using amplifiers now that have brand new technology called DV Mark. I get a fantastic sound…it’s all programmed in. They’re lightweight, the cabinets are lightweight… to me, it’s 21st century technology. I think when it comes to a guitar though, pickup and string technology… it’s all different. But, when it comes to amplification, I think that’s where they’ve made the quantum leap. Now you can plug directly into your computer, but you still need a guitar. What I think is better on guitars now than in the past is the intonation. People are much more aware of intonation now. When I was a kid, it used drive me crazy and I didn’t know how to fix it. I’d be playing above the 12th fret and the notes were flat, but I was playing correctly. It was the intonation, but I didn’t know it. A lot of that is corrected now. I think the making of guitars is so much better now. Just because it’s vintage doesn’t mean it’s good. No one’s going to argue with a 59 Les Paul but I think as far as the guitar goes; I think the makers have pretty much perfected it. You can do little things like tuners and auto-tuners and I saw Fender has new technology where you can create different pickup sounds with different modules in the back. But for me, I keep up on the new technology for guitars, but I’m not so quick to jump on it. I think the electric guitar is like any other instrument in that there are certain elements that they’ve perfected… you can tweak it a little bit, but it’s perfection. They’ve found the right woods and they know what makes a great sound. Look, we have eight and nine string guitars now. It’s a real great era of creativity and I’m always interested in looking at that. I play seven string guitars now more than I ever have. They’re popular and I like them. I have my own signature seven string, so I love the technology, but I’m not that quick to jump on it unless it’s something where I think it’s really going to make a big improvement in what I do. That’s my criteria. The amps now, it’s an improvement. I don’t have to set up pedals. I just turn it on and it’s exactly the sound that I want. What do you think would go into your dream guitar? I am endorser of Dean Guitars, and I really do have my dream guitars already. They make great guitars. I only use stock instruments. The majority of my signature guitars come with EMG pickups and I love them, but I also like passive, so the only thing I change is that on a few of the guitars, I’ll swap out the pickups for Dean USA. I have my own signature pickups, my own signature guitars, so if I changed anything, maybe all of my guitars would be 29 frets. But, then again, I love the sound of 24 fret guitars because the pickup is in a really good spot. I cannot say that at this point in time I would do anything different. I really love the signature guitars that I’ve got, and they’re to my specs. Regarding good play practices, can you go into a little bit about how you maintain your hand, elbow and arm health? I’ve never had surgery and I’ve never had a hand problem. My fingers work perfectly now and I’ve been playing for a long, long time. What I talked about in those “Speed Kills” videos and my techniques way back in those days still apply. That’s why my DVDs and instructional videos have remained so well known. It’s never been about me. It’s never been about “Play like Mikey.” It’s been about learning these things that myself and other guitarists that play great do that we have in common. The thing about guitar is that there are so many differences. There are way more differences in players than there are similarities. So, what do we have in common? What I’ve learned is this: while I do wild things like my over-under technique and the double guitar, those are my show moves. While I am recording, I play as perfectly as I can and when I’m not doing a performance move, my technique is really good. For example, on my fret board hand I minimize the angle of motion from my wrist. You see a lot of old school players… if you play like a blues guitarist; your wrist sometimes is at a 90 degree angle. It’s like your arm and hand become a right angle at your wrist. It’s terrible for your hand. You’re going to get injured sooner or later. So, what I did is minimize that. When I play, my hand is almost straight or slightly curved upwards so it’s a very small angle. I never warm up fast. I always said in my instructional programs that in order to play fast, you have to learn to play slow. It’s harder to get two fingers to do something independently when you’re playing slow because your brain is forced to think about it. It’s almost easier to just whip through it and play fast, which is why some people don’t like fast guitar playing. It sounds mindless to them, and sometimes it is, depending on who does it. What I do is: I start, I watch the angle of my hand when it approaches the fret board and on my picking hand, I minimize the movement as well. I call it ‘economy of motion.’ I minimize the motion on both hands. It enables me to have less stress. When I am warming up, I play really slow or medium speed and I will watch how I play. I have several different warm ups. I have a short, five to ten minute one for when I don’t have a lot of time before a show, and then I have a longer one that I do when I have time. But, the focus is to watch your technique and make sure that you’re not at strange angles where you’re making yourself your own worst enemy. Rule One is technique. Rule Two is warm up slow. That’s it. That’s what I do. I have really good warm up exercises that warm up each finger. I developed all of this stuff myself. I really didn’t have people teach me that, but I’ve never, ever had a problem, so I know it works. On your videos, you can be seen anchoring your picking hand with your little and ring fingers when playing some of the really fast runs. How did you come into that technique? It was by accident. I’m left-handed so my natural way to play guitar was left handed but, I learned how to play right-handed because there were no left-handed guitars available when I was a kid. To get a left-handed guitar, you’d have to order one special. For every 1000 right handed ones, there might be one left handed one. It wasn’t like it is today where you can go pretty much anywhere and find a lefty instrument. So, I learned left-handed, which meant my picking hand was not my strong hand. I had an advantage on my fret board because I could play under-over and all of these things that a normal right handed person could not because it wasn’t their strong hand. With anchoring, I did it by accident. I had luckily stumbled on to a technique that worked really well for me. What I realized is that it really doesn’t matter if you anchor your fingers or you have a free floating play style. That isn’t as important as what you’re doing between your thumb and your index finger. When I play fast, my thumb and index finger tighten up and they don’t move at all. But, when you play with a free-floating position where your hand doesn’t touch the guitar, you do the exact same thing. It’s medium speed to fast that we all do the same thing. We all hold the guitar pick differently, but when we play medium to fast, the thumb and the index fingers do not move. They’re stiff. That doesn’t mean you play stiff, but it means that the pick is flying and you’re not moving your thumb and your index finger to make it fast. That’s the secret. Finally, I am curious to hear your opinion on Rocksmith, the video game that teaches people how to play guitar. Here’s what I can tell you… I’m going to brag about my nephew a little bit. My nephew’s IQ is really high and a mathematical wizard. He’s 13 now and goes to school for accelerated students. He plays guitar and he knows that his uncle is a famous guitarist. Now, I don’t teach privately at all, only through instructional programs and columns, but I tried to give him lessons and he HATED the way I taught him. He actually threw one of my picks at me. He just didn’t like the way I was teaching him. I talked to my brother-in-law, his dad, and he asked if there was anything out there that could help his son learn. So, when I was doing clinics, I’d ask the kids and the adults the same question. Then I heard about Rocksmith a little over a year ago and I told my brother-in-law to get Rocksmith. He gets it and my nephew loves it. He LOVES it. He plugs his guitar in and he’s zapping aliens and learning Sevenfold songs and learning “Born to be Wild.” He likes it because it’s 21st century technology to appeal to the way he thinks. So, to answer your question, I think Rocksmith would help a lot of young kids to be into guitar, which is a good thing. Keep up with MAB at his Website, Facebook, Twitter and Youtube pages. Read the TAM review of Shred Force 1.